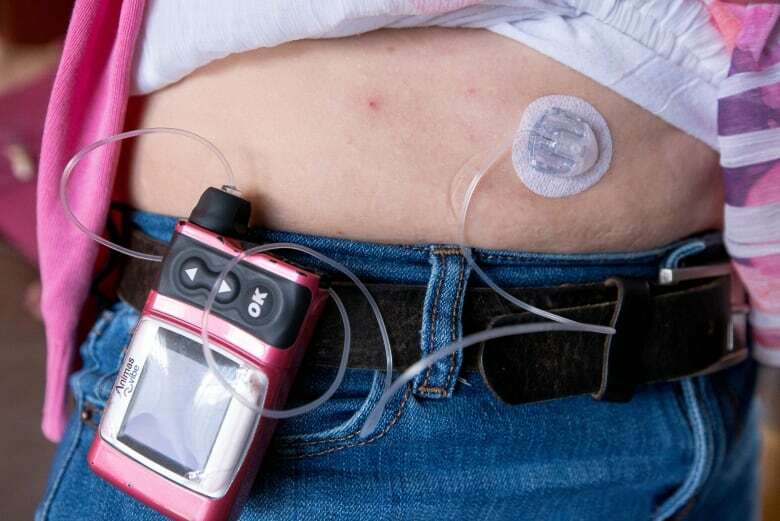 Insulin pumps are popular among Canadians with diabetes. The device is convenient and allows the user a greater degree of control over their blood sugar levels. But some experts warn that's precisely why it isn't necessarily the best — or safest — choice for all people with the condition. "November ... November … 27… November 27, 1963," says Christine Landry, her voice fading over the phone. The 49-year-old registered nurse from Cornwall, Ont., sounds tired and confused. It's the night of July 22, 2012, and Landry called a 24-hour helpline run by Medtronic, the company that manufactured her insulin infusion pump, because a button on her device was stuck and making a loud beeping sound. 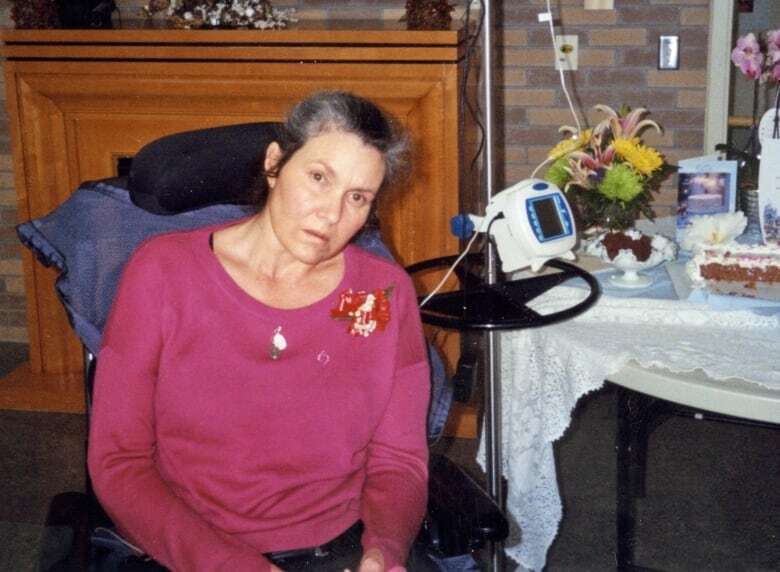 On a recording of the conversation, she can be heard struggling to answer basic questions as she arranges for a replacement pump to be delivered to her home. The next morning, her son, Philippe, then just 20 years old, found her unconscious in her bed. "As soon as I walked up the stairs, I could hear heavy breathing," he said. "When I went into her room, she was foaming at the mouth and I couldn't wake her up. So I called 911 right away." His mother did eventually wake up, but with severe brain damage. The recorded conversation with the helpline was the last time Christine Landry's family heard her speak. They say it's clear from the recording that she was slipping into a diabetic coma. She died this past September. Like millions of people with diabetes around the world, Landry used an insulin infusion pump to try to improve her quality of life. But a CBC News/Radio-Canada/Toronto Star investigation finds that for some people with diabetes, depending on their level of training and knowledge, the popular device might not be the safest way to regulate their blood glucose levels. 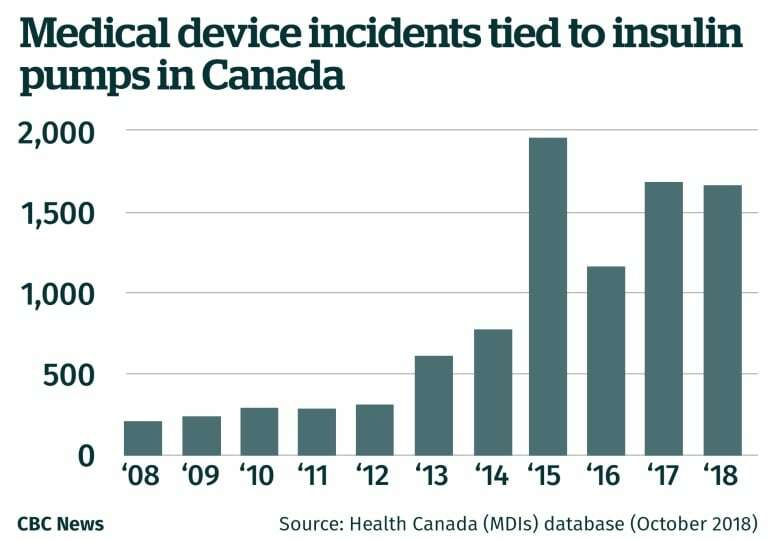 Health Canada data obtained under Access to Information reveals that in the past ten years, insulin pumps have been the subject of at least 40 recalls and may have played a role in 103 deaths and more than 1,900 injuries — more than any other high-risk medical device in the health agency's database. The records did not include any information on how many pumps are currently used in the country. In a statement, Health Canada said that's because "it does not require manufacturers to provide sales numbers for medical devices". The pump performs some of the functions of a healthy pancreas, slowly dripping insulin through a tube and needle under the skin, helping a person with diabetes to control their blood sugar levels. It's marketed as an alternative to injecting insulin using disposable needles or pens several times a day. Pumps were first approved in Canada in the early 1980s and have become increasingly high-tech. They are now just a bit smaller than an iPhone and come with special features such as a "wizard" button that calculates a recommended dose based on the user's carb and insulin intake history. Manufacturers and provincial governments consider pumps so safe and simple to use, they are recommended and insured for children. Many people with diabetes say insulin pumps are convenient and provide them with more control over their blood glucose levels than the traditional syringe or pen methods. The pump uses only rapid-acting insulin, which means the user can have worry-free meals and snacks at the touch of a button. The pump's constant drip of insulin can also help with the so-called dawn phenomenon, a potentially dangerous surge in blood sugar in the early morning. But some doctors warn the convenient device requires considerable knowledge and skill to be used safely and effectively. Dr. Peter Senior, an Edmonton-based endocrinologist who has done consulting work for pump makers, says the devices can be life-changing, but only for people with diabetes who have learned to manage their blood sugar levels. "The misconception," he said, "is that [pumps] will think for you. They will make the decisions. But the pump is just a dumb device that will do what you ask it to do. If you forget to ask it to do important things, or you ask it to do wrong things, then problems can arise." Senior points out Type 1 diabetes carries life-long risks regardless of how people with the condition choose to receive their insulin. "Many of them find it a struggle," he said. Initially, Philippe Landry didn't understand how his mother could have been so severely injured using a device she was convinced made her life so much better. She used to struggle to control her blood glucose levels, he says. She thought her Medtronic pump was the solution. She loved her insulin pump so much she became a certified pump trainer, paid by Medtronic to help other Cornwall-area residents with diabetes to use their devices. But her family now says it's possible using a pump was never a good idea for her. They say she was what is sometimes referred to as a "brittle" diabetic, meaning her blood sugar levels were unstable and sometimes reached extreme highs and lows. 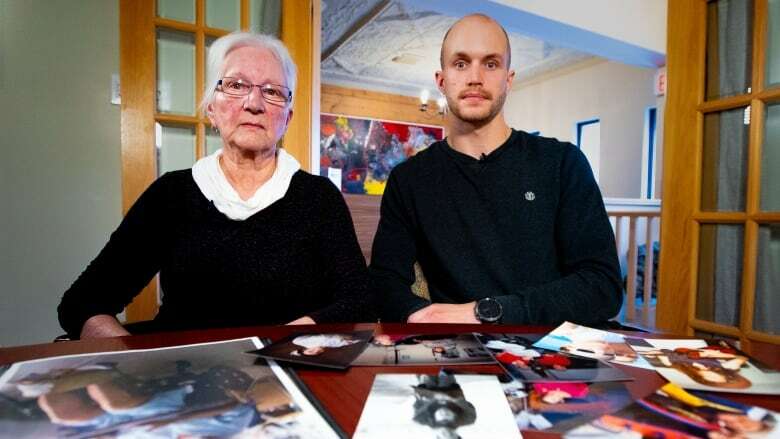 "If she knew what we know now, she wouldn't have gotten involved in that," said Christine's mother, Huguette. "She was ... not even a candidate for the pump. I don't know if anybody had mentioned that to her." The Landry family is suing Medtronic, alleging Christine Landry's pump and infusion set malfunctioned, causing catastrophic and permanent injuries. The company recalled the VEO Paradigm Insulin Pump model a year after Landry's injury. In its statement of defence, Medtronic says Landry acted negligently and was "fully aware and informed of the nature of the risks associated" with her insulin pump. The manufacturer says Landry "failed to properly manage her alcohol and food consumption, monitor her glucose levels and instruct family members on the appropriate response to diabetic incidents." Dr. Senior estimates that as many as 10 per cent of Type 1 diabetics are using an insulin pump, which could amount to 30,000 Canadians. In the U.S., it's now 40 per cent. He worries the devices are being "pushed too heavily at patients who've not been adequately trained in managing their diabetes." Dr. Simon Heller runs a five-day course for people with Type 1 diabetes in the U.K. As part of a study, the professor of clinical diabetes at the University of Sheffield gave a group of 317 insulin pump and needle users the same training and compared their glycemic levels and quality of life over time. "One of the reasons we did this trial," he said, "is that we are concerned that people might use the pump expecting the pump to fix them." His two-year study, published in the British Medical Journal, found that after both groups completed intensive training on insulin management, participants using pumps reported only a slightly better quality of life than those using needles. He found that increasing a person's understanding of how to manage their condition is just as important as technology. Ontario's Mary Krueger says Health Canada has a knowledge gap of its own when it comes to insulin pumps. Krueger says her son, Steven, was an energetic and adventurous young man, living life to the fullest despite his Type 1 diabetes, with plans of becoming a licensed pilot and certified diver. He'd purchased his Paradigm MMT-511 insulin pump in 2002, shortly after it was approved by Health Canada. He loved the freedom the pump afforded him. He told his mother it was working great. 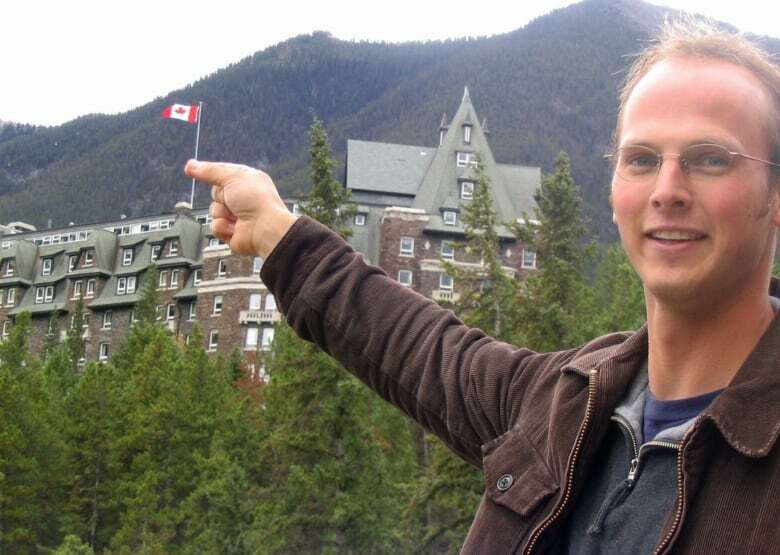 But, on June 18, 2006, the 27-year-old was found dead in his bed at his home on B.C. 's Thetis Island. A coroner's inquiry ruled his death was accidental. The report said a "malfunctioning insulin pump" might have contributed to an insulin overdose. Looking for answers, the Kruegers shipped Steven's pump to Health Canada's medical device laboratory for analysis. "We felt that Medtronic needed to be held accountable for what had happened," Mary Krueger said. "We wanted them to acknowledge that something had gone wrong with the pump." The family soon realized the government's expertise was limited, she says. Health Canada found a malfunction with the pump: it was stuck in "prime" mode, a setting used to test the insulin drip. Instead of injecting a few test drops, Steven's pump didn't stop, the report says. It "ejects all the insulin in the cartridge," which could cause an overdose. But inspectors couldn't open the pump casing to confirm the cause of the problem. 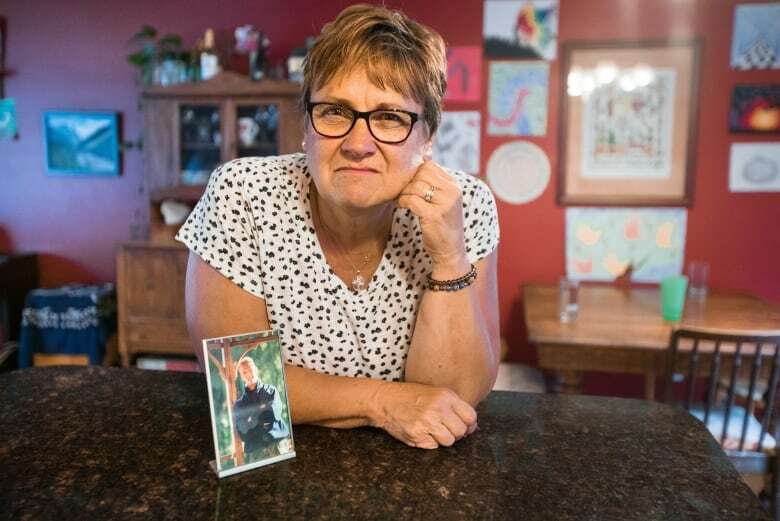 Mary Krueger was told to return the product to its manufacturer, Medtronic MiniMed, for further investigation. Steven's pump model was the subject of multiple recalls in Canada and the U.S. since his death, including an alert in 2014 that mentioned "users who have unintentionally programmed the pump to deliver the maximum bolus amount." Looking back now, Krueger thinks Health Canada was ill-equipped to investigate. "We should have had the answers right away when he died. We had to do a lot of the investigation ourselves." The problem isn't unique to Canada. In the U.K., a 2013 coroner's inquiry into the sudden death of another insulin pump user expressed concern about a "lack of analysis of medical devices post-mortem," especially since insulin pumps had become so popular. However, in 2010, Health Canada actually closed its Bureau of Medical Devices labs to cut costs. Briefing notes sent to Health Minister Leona Aglukkaq at the time, and obtained by CBC News, show the department was under pressure to approve licences for a growing number of medical devices. To pay for that work, cuts had to be made to "lab research in low-impact or non-critical areas." In a statement to CBC, Health Canada said lab testing is now done by device manufacturers themselves or outsourced to third parties. "This is more cost-effective and allows the department to access state-of-the-art facilities across all areas, rather than maintain lab capacity related only to specific scientific domains." Health Canada also said because of "recent post-market concerns" with all infusion pumps, including insulin pumps, it now requires manufacturers to submit evidence of more rigorous testing on their devices before they can be approved for sale. In a written statement to the International Consortium of Investigative Journalists, Medtronic said "numerous clinical studies" have shown its insulin pumps "improve blood glucose control in patients with diabetes." 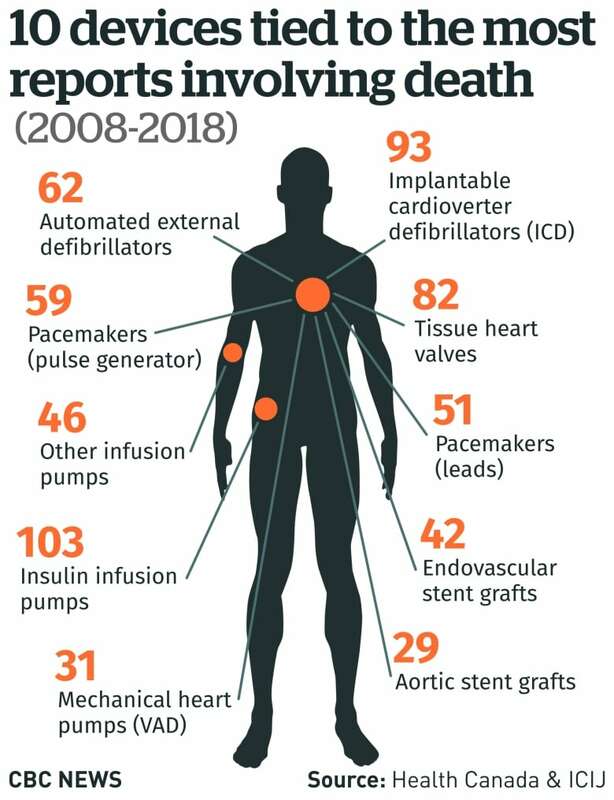 The company also points out that adverse event reports sent to Health Canada do not establish whether a medical device actually caused an injury or death.